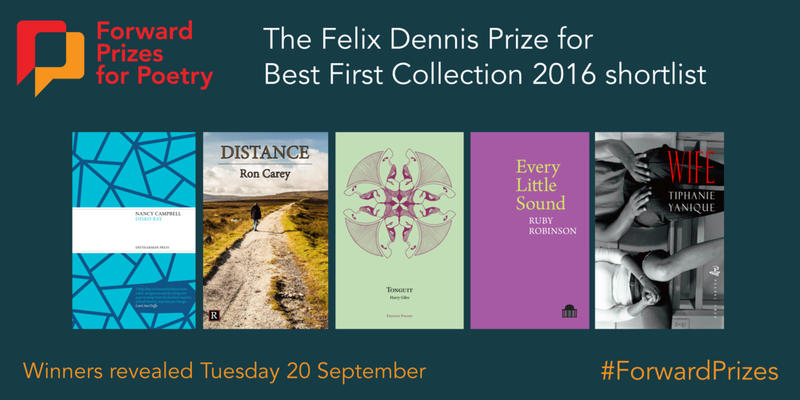 This year’s contenders for the Felix Dennis Prize represent an exciting new generation of poets emerging beyond the bounds of well-trodden publication routes like Faber’s New Poets scheme. 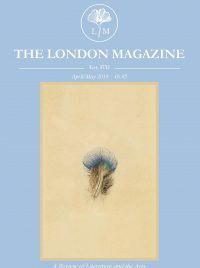 From Tiphanie Yanique, an award-winning American fiction writer and poet, to Harry Giles, a familiar name on the Scottish spoken word circuit, and Ron Carey, a former engineer and recent graduate of the University of South Wales’ MPhil in Writing, the prestigious shortlist (rightly) recognizes growing contributions from outside a traditionally London-centred ‘new writing’ scene. Harry Giles’ Tonguit (Freight Poetry, 2015) is almost certainly the most formally and linguistically inventive on the list. Concrete poems like ‘Alpe d’Huez’ and ‘Piazza dei Miracoli’ sit alongside lists, haiku sequences, pantoums, and modified sonnets, all in a smattering of Scots, carefully pruned English, and textspeak. These varied experiments amplify, rather than limit, Giles’ ability to speak to the literati and the casual reader alike. Some poems (‘Visa Wedding’, ‘Tae a Cooncillor’) address the realities of austerity and public housing, while others (‘In yer haunds thare are nae deid hings’, ‘Hogmanay’) demonstrate a clear finger on the pulse of Scotland’s independence debates and the writer’s place in them. At the same time, Giles steers clear of straightforward nationalism (the broad church of this collection includes, for example, a Scots response to seven numbers from the Tao Te Ching), in favour of the ironic, self-critical stance of his opening poem, ‘Brave’: ‘A sing o a Scotland whit hinks thare’s likely some sort o God, richt?’ We sing and wonder with him. chemistry is. She said all sorts of things. Deceptively conversational, Robinson’s poems pay dividends in each repeated reading with their subtle rhymes and ear for meter. As a result, these pieces do not falter on the backs of their somewhat staid titles (‘Love’, ‘Time’, ‘Romance’, ‘Tea’, ‘Boy’, etc. ), but excel in their ability to return these words their full breadth and depth. Several ventures into prose and long-narrative confessional poetry punctuate the collection, but the best pieces (such as ‘Ire’ and ‘Tuning Fork’) are pared down to couplets, and are stunning precisely on account of their grace and restraint. Similar to Disko Bay in its ability to render a familiar landscape bare and startling is Tiphanie Yanique’s Wife (Peepal Tree Press, 2015). These are hard-hitting poems about our most intimate relationships, at once beautiful and raw with Yanique’s honest handling. Early in the collection, ‘Dictionary’, a prose poem, sets the tone: ‘wife – (European origins) a married woman. As in slave in the house. As in chef, maid, nanny and prostitute. But unpaid for these services.’ The rest of the book, like the rest of this piece, challenges our ideas of what words like ‘home’ and ‘family’ mean. Complex historical and rhetorical traditions underpin each poem, taking us into Christian allusion (‘Therapy for a Messiah Complex’, ‘Altar Call’) or colonial history (‘A Slave in the House’, ‘Traditional Virgin Islands Wedding Verse’), but always with an eye to the daily tragedies of domestic relations in the present. The last section, ‘Words (Last, Fighting, True, Etc. )’, emphasizes especially how Yanique’s burnished diction ultimately lends this tough collection its shine. On the floor, shouting, Christ is laying-off Brickies. It was too late when you came to say goodnight. Like Wife and Disko Bay, this book is divided into sections, and among them ‘The World Will Break Your Heart’ is the longest and most refined. Pivoting away from the personal histories of the book’s first half, this section focuses on Carey’s work, children, and community, drawing the generations close through poems like ‘My Father Built England’, ‘Fixing A Dry Stone Wall’, and ‘Fathers and Sons’. It is these haunting lines from the section’s – and the book’s – shortest poem (‘In A Doorway’), however, that best sum up this searching volume: ‘I don’t know / If I am still worth a question. If I am / Still worth passion or pity or care. / I only know I am becoming more / Human and, in my arm, an exquisite flame’. Last year, the Prize – previously won by Kate Clanchy, Don Paterson, and Daljit Nagra, among others – went to Small Hands, a wonderfully articulate collection by Mona Arshi. Whichever volume emerges as the winner this year will be a well-deserved addition to the Prize’s distinguished history. All five poets have grasped something that needs to be said, and in their own distinctive, exquisite ways, have made us ‘more human’. This is far more than a prize could recognise.